Effortlessly add a member paywall for Weebly, Squarespace, Yola, WordPress, Blogger, Duda. 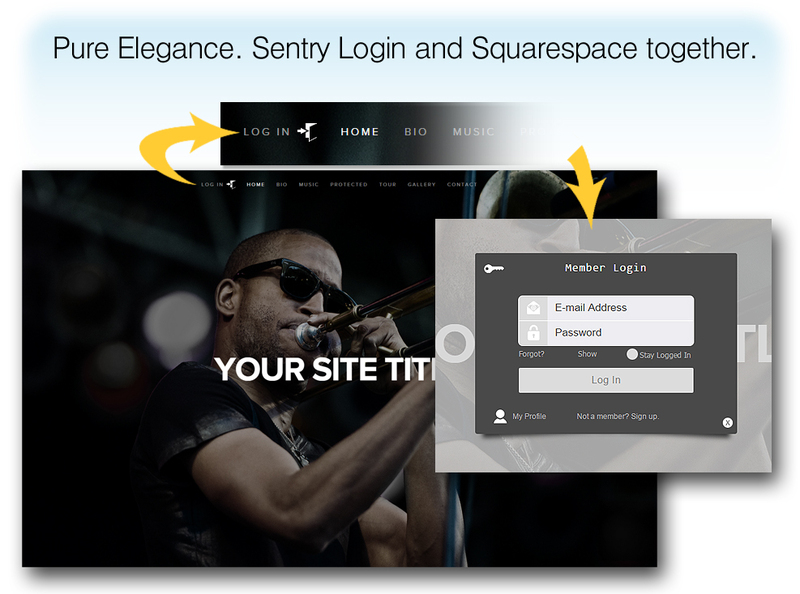 Sentry Login provides Squarespace member login. Sentry Login is the #1 Member System for Squarespace, Weebly, and WordPress since 2001. Works with these and many more Sentry works great with WordPress Sentry works well with Weebly websites	Sentry works great with Squarespace Sentry works perfectly with Yola Sentry lets you protect Blogger pages! Easy, affordable paywall and password protection for Weebly, Squarespace, Yola, Blogger, WordPress and more. 1 It's all Copy & Paste! Sentry is easy: it was created with non-programmers in mind. All login form and protection code is provided so all you have to do is Copy, Paste, and Publish. The built-in Sentry Integration Wizard guides you in setting up your subscription plans and takes you through the installation, too. Sentry is easy, but if you ever get stuck, our friendly staff responds quickly to your email help requests... for life! No one has better or faster support. NO ONE. Using the Header / Footer (skin) tools, you can easily set the appearance of Sentry's forms and pages to look more like your site. Better yet, let us create your skin branding for you! The service is free. Easily add your own fields to the signup form so members provide you with all the information you want. You can tell Sentry to deliver a member directly to a page just for them, set your plans to land on a specific page for that plan, or drop off all members to any particular page you wish. Our search tools help you to manage members easily within Sentry's Members Listing. Complete manual control of member status and more. Easily export selected members to a .CSV file suitable for importing into third party applications like MailChimp. 9 Stripe Webhooks with no programming! Stripe Webhooks automate member status based on their payment activity. Failed payments are banned automatically, and much more. You don't have to write a single line of code. 10 Bring PayPal Subscriptions IPN to Life! PayPal Instant Payment Notification automates member status based on their payment activity. Failed payments are banned automatically, and much more. Sentry Income Stats calculate your income from all currently active members to your subscriptions so you can see at a glance how you're doing. Sentry Login beats Weebly's membership offering on features and performance. Unlimited members, and Sentry works with FREE Weebly accounts! No wonder we get so many of their quitters! Sentry Login is the preferred paywall system on the Web. Sentry Login beats GoPaywall's membership offering on features and performance. No wonder we get so many of their quitters! At just $4.95 per month, Sentry costs just pennies per day! MemberSpace can be costly when your member roster grows very large. Here's a basic Sentry Login introduction that shows how easy it is. Rather watch on YouTube? Click Here. In this intro, see how easy it is to add a member login box and page protection to your website. Sentry Login lets you monetize your website, members must log in. Also shows customization tips. Have you asked "How can I add membership to my website?" or "Can I get my site visitors to pay for access?" You've just found the easy to use system that lets you put a login box and paywall on your site. With effortless setup and unlimited members, Sentry is the premiere password protection solution. Six of the last ten times you've logged in at a website were likely powered by the technology of Sentry. Sentry supports WordPress, Weebly, Squarespace, Yola, Blogger and most others. Find out today how easy it is to monetize your website. Try Sentry with your website today. Give it 7 full days. If you're not completely satisfied with the performance, seamlessness, and level of control it offers, cancel within that time and you won't be charged. You have nothing to lose. And should you have questions, help is just an e-mail away with unlimited friendly tech support! Scroll down to view a fuller summary of Sentry features below. Sentry makes it easy to turn any site into a members only website. Sentry Login is Proudly Rated 5 out of 5 Stars on Capterra! Sentry Login works with: Weebly, Squarespace, Yola, WordPress, Blogger, Yahoo Sitebuilder, GoDaddy, Webflow, Adobe Muse, and any other system that does not employ iFrames. Sentry works with Stripe, PayPal Subscriptions, etc. Q: Can I make money from members? A: Yes! With Sentry, members will pay you for access. You can charge weekly, monthly, annually... any terms and time period you desire. Q: I want my members to sign up... but for free. Can I do that? A: No problem. You can set your account to let members sign up without paying. Q: Does Sentry allow me to put a password login, also known as a login form, on my website? A: Yes! Using Sentry, your website will become a membership site with just a few easy edits. Q: Is Sentry hard to set up? A: Not at all. If you're already skilled enough to edit your web pages, and you're able to place your web pages online, then you already have the skills to use Sentry! Q: Do I need to make any alterations to my server? A: No. All you have to do is copy our code, paste it, and then upload some pages. There are no difficult settings to change on your server. There's no need to contact your web host's tech support line. Q: Will I have to install executables (programs)? A: No. Sentry is a script-powered application, so all you have to do is copy our snippets, paste them, and then upload files. There aren't any .exe files to install. Q: Do I need to be fluent in Active Server Pages or PHP, or any other programming language? A: No. While Sentry Login does make use of scripting, it is specifically designed for a non-programmer (you!). It's a breeze to set up, effortless to maintain, and easy to use. Full step by step instructions are provided. Q: Can I make modifications to the "look and feel" of the login form and the Sentry-generated pages? A: Yes! You can fully change the login form in HTML to reflect the look and feel that you want for your website. Q: How do I Password Protect just some parts of my website? Can Sentry let me protect some pages, while letting others remain public? A: Yes, Sentry lets you protect your pages on an individual basis, giving you the ability to have both public and private password-protected pages in the same directory on your website. You just paste the protection code into the source code of pages you need protected. Q: I'm a "newby" to the Web in general. Which editing programs can I use to implement Sentry? A: There are a number of website editing applications available on the web that let you edit your site, such as WordPress, Weebly, Yahoo Sitebuilder, Yola, Squarespace and lots more. The program that you're most comfortable with is the best one to use. Q: Can I password protect Blogger blog pages? A: Yes, Sentry is one of the only ways to actually turn Blogger pages into members-only pages. Sentry works great with Blogger. Q: Are there any Ads or Pop-ups? A: Never, never, never. Your members never see advertising... not in the signup, member profile, password reminder, confirmation e-mail... nowhere. Q: How much does Sentry cost each month? A: Sentry is only $4.95 per Month. Q: Can I try Sentry for Free? A: Yes, with our Free Trial, just go ahead and subscribe to Sentry. Enjoy it for up to 7 full days. If you decide Sentry isn't for you, simply cancel before being charged. No hassle.